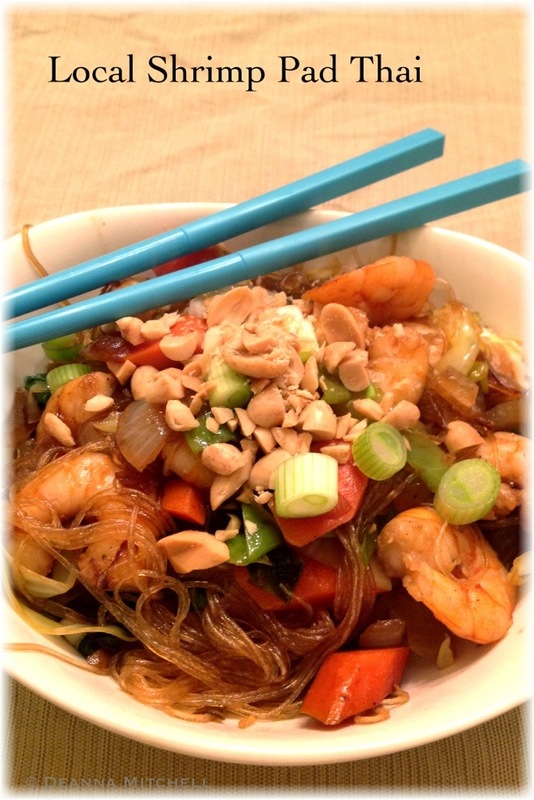 This homemade version of Pad Thai uses fresh vegetables from the farmer’s market and local shrimp! Do you have new year’s resolutions? Do they involve new work out clothes, expensive sneakers and maybe some videos or a gym membership? Well here is one resolution that doesn’t require anything extra. The wonderful thing about SOLE food eating is that it doesn’t require special cookbooks, expensive single-purpose kitchen tools or endless tutorials. Almost any recipe can translate into local cooking with a few substitutions from your garden or local farmer’s market and some creativity. And you were going to buy food anyway, right? I follow a lot of blogs–some are oriented toward local food, but others are people who like food and can really rock a recipe. One of my favorite blogs is Sugar Dish Me at www.sugardishme.com . Heather does a terrific job of making good cooking accessible. And she’s hilarious. I couldn’t wait to try her Easy Lightened Up Pad Thai and it was very good, even if I couldn’t find the right kind of noodles. This recipe can take advantage of whatever vegetables are fresh and handy, it’s quick to prepare, and you can combine all kinds of protein and vegetables to change it up. Like cooking magic! Combine that with a trip to the gym or a long walk and you really have some magic! This is the slightly altered version of Heather’s recipe that we tried for supper. I tried out our new jar of coconut oil and it just may be my go-to fat for stir frying (I hate peanut oil–my thing). We used lots of organic, local vegetables, shrimp from Locals Seafood and North Carolina peanuts! I highly recommend trying this with whatever is in your fridge and check out Heather’s blog while you’re at it! Heat the coconut oil in a large wok. In a bowl, add bean thread noodles and cover with water. Let sit for 10 minutes. Add shrimp and cook quickly until pink, about 2 minutes. Remove to a small bowl. Add the sesame oil to the wok and heat. Add the onion, cabbage and carrots. Stir fry over high heat for about 4-5 minutes, or until vegetables are soft. Add the garlic and continue to cook for 1 minute. Add the soy sauce to the vegetables and stir. Drain noodles and add to the wok, tossing quickly (the noodles will want to clump together, but keep tossing them in the wok). Add the shrimp back to the wok and heat through. Add servings of Pad Thai to bowl and top each serving with green onions and peanuts. Harris Teeter carries it. So does Ingles. I will check at the Teeter. The bean threads weren’t bad, but they are irritatingly stretchy! Thanks for reading along! I don’t do well with peanuts either. The coconut oil is terrific at high heat! Hope you will try it! This dish looks great. I love cooking woth coconut oil. It’s light and extremely versatile. Thanks so much for adding one of Our Little Family Adventure’s recipes to your Sole-ful musings. I appreciate the link love.